Simply put, "Splatoon" is paint ball without the ball. The objective is straightforward: splatter everything in ink. There are variations on the theme for any ink-lination: multi-player turf war battle, a story mode, recently-unlocked ranked battles, etc. 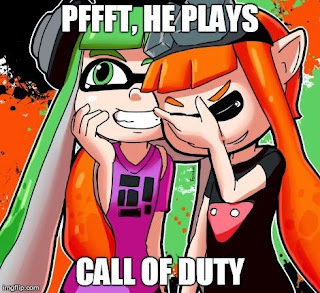 Anyway you cover it, "Splatoon" is light, fast-paced, addictive fun. On the heels of "Super Smash Bros. Wii U" and "Mario Kart 8," "Splatoon" extends Nintendo's win streak to three with its most-unusual entry in a while. Ironically enough, it was originally conceived as a Mario game before morphing into anime punk-inspired urban warfare. 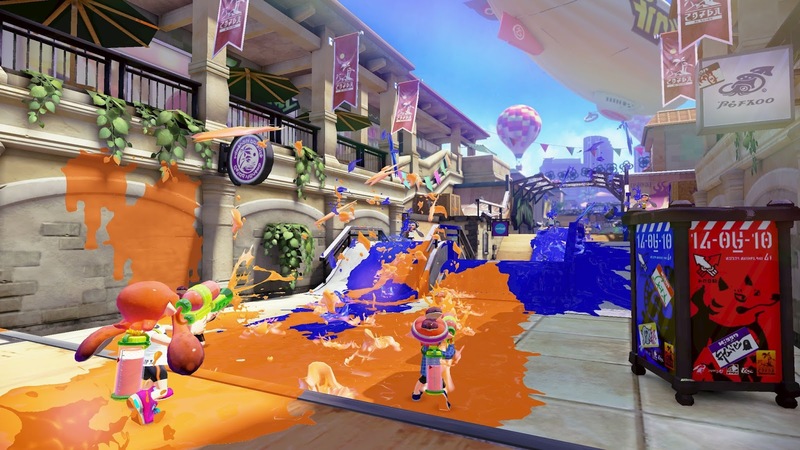 The Inklings of "Splatoon" splatter everything in sight in a 4-on-4 turf war. The innovative aspect of the shooter -- and again, only on Nintendo -- is the ability to transform your character, or Inkling, into a squid, reminiscent of the Bloopers from the Super Mario series. Fully utilizing the touch screen game pad on the Wii U., players move, jump and, most importantly, shoot. 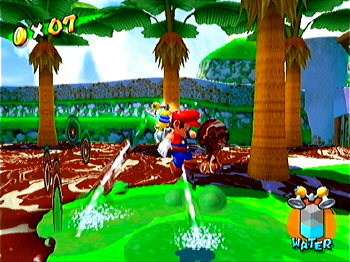 The ink-spreading mechanics are very similar to the FLUDD device from "Super Mario Sunshine," Nintendo's underrated Mario installment on the GameCube. Mario douses Isle Delfino with his FLUDD backpack. As players paint up Inkopolis, they replenish ink by turning into squids and swimming through what they've already spread. It's an interesting dynamic, one that relies on being able to stay near the player or team's given color. The game's most-basic mode is the 4-on-4 online turf war battles. It's there that players build up points. The team with highest percentage of map marked with its ink color as territory wins. There's decidedly less emphasis on taking out opponents and more on tagging turf. "Splatoon" allows for a ton of customization, however you're ink-lined. After choosing a boy or girl Inkling and their skin hue, you can then outfit them with a seemingly-endless amount of gear to increase basic attributes like defense and speed. 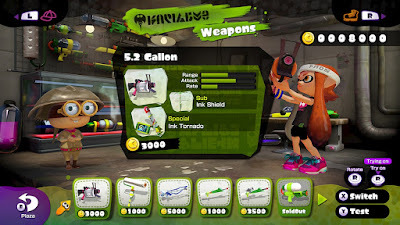 There are various ink-arnations of armaments from the Splattershot rifle, the bazooka-like charger or roller and the uzi-esque Splattershot jr., each coming with the ability to throw a different type of bomb, making for a nice mix of melee and precision weaponry. Nintendo rolled out "Splatoon" for a free demo in a series of one-hour global test-fire events over the course of three weeks leading up to the game's release. Players rotated between two of the multi-player maps, Walleye Warehouse and Saltspray Rig, after a brief in-game tutorial. The final test-fire saw a massive mis-fire of connectivity issues due to demand, so Nintendo extended it another two hours. The online battle maps rotate in pairs on the hour, which can lead to repeatedly playing in the same space. Hopefully Nintendo will eventually find a way to allow more variety a la Mario Kart or Smash Bros.
Much has been made of the lack of microphone/headset communication in "Splatoon" but, to be honest, it isn't needed. Would it be nice? Sure, but we have enough "Call of Duty" clones out there already. 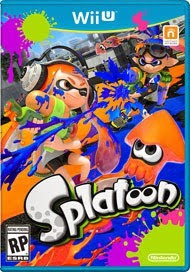 "Splatoon" launched with five maps and added a sixth, Port Mackerel, on its fourth day of release as well as several new weapons, including a cool homage to the NES Zapper light gun. Nintendo has promised free downloadable content throughout the summer. Another short-term way to add content is Nintendo's Amiibo figurines. If you haven't dipped your toe in that pool yet, be aware they sell out quickly. Nintendo's decision to only package the squid in a three-pack already seems a regrettable decision, but the company has vowed to make more available after early shortages. "Splatoon" is airy-yet-intense addition to Nintendo's stable of quirky titles and that, in the end, is where it's splat.